Last Sunday, Kingaroy police officer David Tierney was out walking his dog when he spotted a vehicle parked outside a Kingaroy newsagency. “I hung around for five minutes and no one returned to the vehicle in that time. And it remained like that for the next five minutes,” he said. It’s behaviour like this which has South Burnett police pulling their hair out. 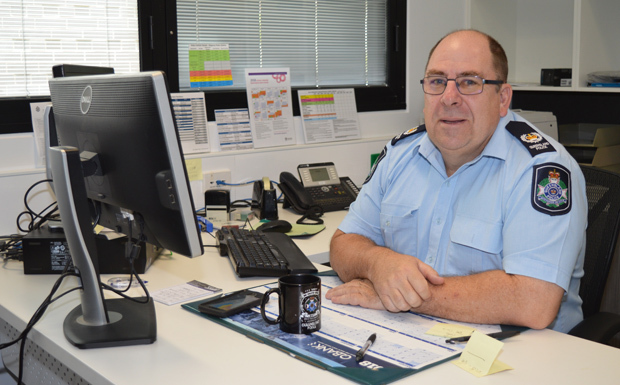 Senior Sergeant Tierney, the Officer-in-Charge of Kingaroy police station, is bewildered that people are ignoring police pleas to “lock it or lose it” – particularly in light of recent, highly publicised vehicle thefts in the region. “The majority of unlawful entry offences, either to residences or vehicles in the South Burnett, are opportunistic (not targeted) and are committed on premises/vehicles that are left insecure,” Snr Sgt Tierney said. A Holden Colorado stolen from a driveway in Fairview Drive – the owner had parked the vehicle and left the keys in it. A Toyota LandCruiser stolen from a rural property – the vehicle was unlocked, the keys were in the ignition and an unsecured rifle was in the vehicle. The firearm has not yet been recovered. “In both cases it was opportunistic,” Snr Sgt Tierney said. “It’s not good enough to say: ‘I was near the vehicle I didn’t think it would get stolen’. “They WERE stolen and unlike past times luckily no person was injured. Snr Sgt Tierney emphasised that is actually an offence to leave a vehicle insecure ($52 fine). “I don’t want it to resort to my officers having to issue these type of fines,” he said. “But I guarantee I could walk down the street now and write numerous fines for this. “People need to start thinking smarter and make it harder for the criminals. “Unfortunately we no longer live in a society where we can assume people will respect our property. Why not? This might be the only way to break through the apathy! I myself have seen this three times recently in Murgon-Wondai area, not anybody in sight anywhere, not even a big dog on the seat for protection!! How could anybody live there and be so brain dead so as to not realize that actions as this could have severe consequences?